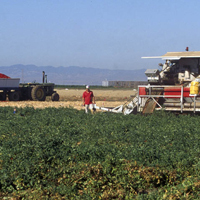 Located on 320 acres in the San Joaquin Valley, WSREC has land suitable for growing row, orchard and field crops, and turfgrass, landscape and nursery plants. The center also provides labor, equipment, facilities and technical and management support to UC academics and to personnel from co-operating non-UC organizations, such as USDA. Approximately 7,000 hours of labor will be awarded to support approved projects.